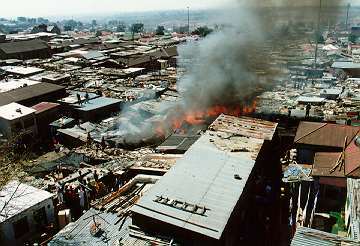 In early April 2000 a new team of firefighters tackled a shack fire in the middle of Brixton, Johannesburg. 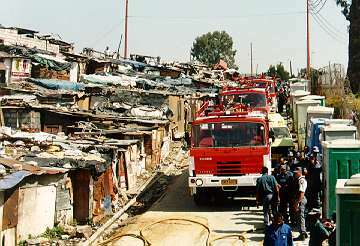 The shack has been built for the residents of the Joe Slovo squatter camp in the grounds of Brixton Fire Brigade, to demonstrate their newly-gained skills in fire fighting. The ongoing initiative is a joint venture between the charity Children of Fire and the Greater Johannesburg Emergency Management Services Public Education Section (Emergency Education for short). The next firefighting course will be run in July or August 2000 for residents of the massive Diepsloot Squatter Camp. Many residents of Diepsloot were moved there in order to make space for the Africa Games athletes' village built on the edge of Alexandra Township. Some Diepsloot course participants have been selected in co-operation with the Johannesburg Association for the Aged, and catering for trainees is being done in co-operation with the Othandweni Bakery that helps give street children a chance for a career. Children of Fire helps badly burnt children but it is now taking a vigorous role in trying to prevent young southern Africans from being so badly injured again. Children of Fire co-operates with St John Ambulance in taking First Aid education into the squatter camps and on July 21, 2000, their second joint training scheme starts inside Diepsloot Squatter Camp in Gauteng Province. The emphasis is on enabling people to help themselves; to prevent injuries and fires in the first place; and for all the successful trainees to be empowered to train others. Children of Fire director Bronwen Jones underwent firefighting training alongside what may eventually become the Joe Slovo Proto Team - a team of multi-skilled people who once had no hope and no work - but who will go on to train and protect communities like their own. Jones comments: "The hardest part of training was finding our way around the Smoke House in total darkness, looking for people who might have been stranded by the fire or by smoke inhalation." The Johannesburg Fire Department's Public Education section offers many community outreach programmes to promote safety and fire prevention behaviour. The public education section of the emergency services educates the public, especially children, on how to protect themselves from fire and other risks. Protecting families and property from the dangers of fire is an on-going lesson requiring re-enforcement from home, school and community initiatives. Fire statistics show a sharp increase in incidents reported to the fire brigades during 1998. 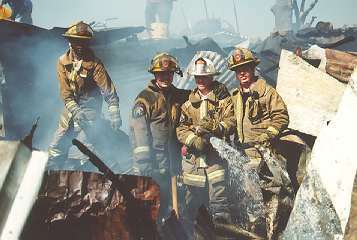 A total of 37 604 fires were attended to in 1997 and 52 753 in 1998. There was a 25 per cent increase in residential fires, and the number is increasing. Fires in homes remain the biggest fire problem. There are some five thousand fires in conventional homes each year but there are no reliable figures for squatter camp fires as they are too frequent and too many homes are lost each time. The insurance industry says that the 1998 fire loss exceeds R1.3 billion. That is R3.6 million per day or 150 thousand Rand per hour went up in smoke every day throughout that year. There are no accurate national statistics for deaths by fire let alone for serious injuries due to fire, but Children of Fire is starting to display some statistics on this website. The level of injury is high; the injuries are exceptionally painful, usually permanently disfiguring and disabliing, and the cost in terms of medical care is enormous. Fires are most commonly caused by open flames and are mostly preventable. Fire and injury prevention education provides an important role in the reduction and prevention of such losses. Since running the initial courses, trainees have put their skills to good use. Mlungisi Cakile said: "Within two weeks of being trained in first aid, I saved the life of a man with a panga wound to the head; another man with a stab wound to his chest; and a child who had drunk paraffin." [A panga is a machete]. Another trainee, Dan, said that he had to extinguish a fire on the second night of his three-day course. "Without the training I wouldn't have known how to react quickly. My neighbour's shack was on fire but I put out the blaze." In June 2000, Children of Fire in co-operation with the German School of Johannesburg, installed two swings for children in the Joe Slovo squatter camp. This "Operation Firebreak" is an endeavour to replace burnt-down or abandoned shacks with firebreaks. To keep the areas open they will be planted attractively or given an amenity such as toys for the children.